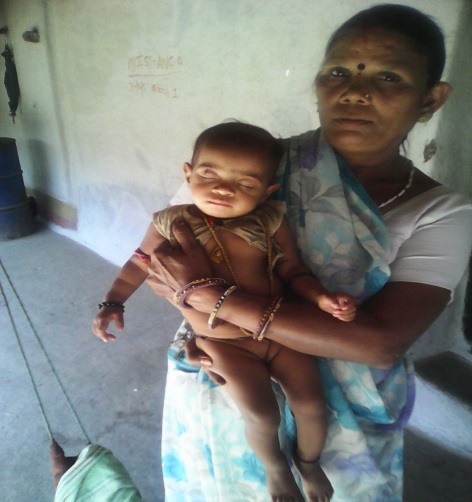 This is the story of an Anganwadi worker from the Gram Panchayat of Lakshmanpura. Munni Rajput, wife of Bhoor Singh, is an aanganwadi worker who words with the Bheel community in Lakshamanpura village, in Raghogarh block of Guna district, Madhya Pradesh. As part of her role and responsibility, Munni collects information on pregnant women and women with new born babies, besides malnourished children. However, she finds it extremely difficult to make the community members take her advice. Munni has on several occasion urged the mother of a one-and-a-half-year-old malnourished girl, Muskaan, to admit the child at the nutrition rehabilitation centre nearby. But the mother, Devi Singh, never agrees. However, after the last time the child came to the aanganwadi Kendra for immunisation, Munni went to Devi Singh’s house with a Soochna Sevak with the determination that she will not leave the house until the mother agrees to take an action in favour of the child’s health. The two, after much debate, managed to convince the parents and got Muskaan admitted to the nutrition rehabilitation centre. Munni says that had Soochna Seva not interevened, it would have been even more difficult to convince Muskaan’s parents. There is a certain amount of faith that people in the village have for Soochna Sevaks, she says.